The elements of the Life Wall have been encouraging me to dig out all sorts of stuff that was buried away, and recall events and dates (sometimes with the aid of my wife and others) which were already only dimly there. But they have been brought back to vivid life through developing my personal Life Wall. I assume everyone will want photos of them when very young on their Life Wall… there are few events in life as important as being born! The baby photos of me at a few months old and age 1 year are up there now. Did I look cute then? The live Life Wall is at http://atate.org – Hover a mouse over a tag or clipping for more detail. Click on the thumbnails for some larger versions of the images. I had already added a link to a “Life Map” on which I think a lot of life’s experiences could be noted through places visited and dated events. I feel this element of the Life Wall could be so valuable, that I have adjusted the clippings column that will map to one HD screen of presentation to allow for an embedded Life Map directly on the main display. There is a link to a larger map which could then be shown over 2 X HD displays when clicked. The Life Wall idea and presentation could also be adapted to professional purposes, e.g. to collect together and present a researcher’s entire scientific contribution. It could allow then to look at their work and relationships. They could bring in professional contacts and the mappings between people, projects, organisations, tools, etc. Displays could include professional social network and project relationship diagrams (e.g. 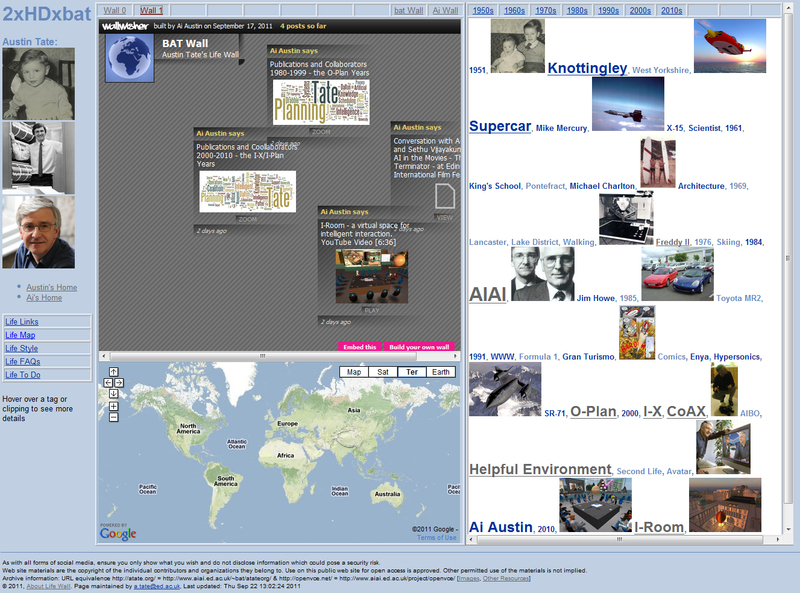 CMU Catalyst), FOAF, knowledge asset roadmaps (Macintosh, Filby and Tate, 1998), etc. I am developing this aspect now. As for Life Map Personal I hope to make the approach reasonably general and create an empty life map web area which other can copy and adapt to use themselves.